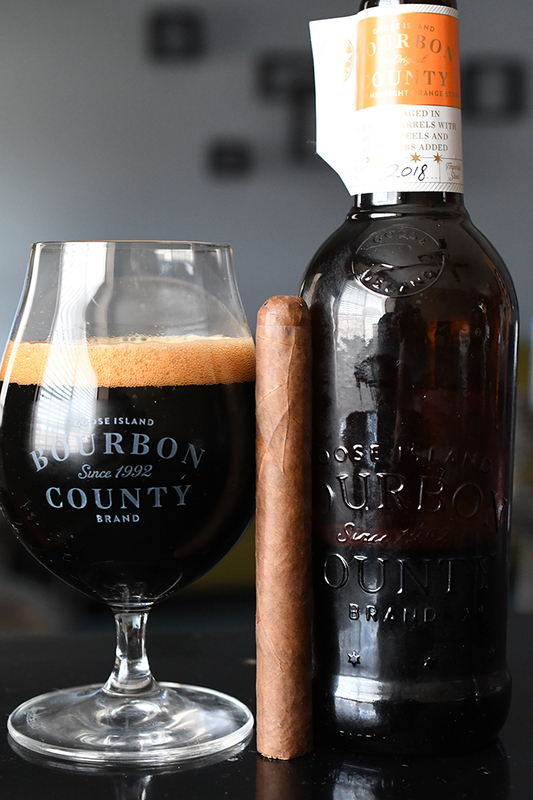 While Jeremy is up north buried in snow I find myself in a mild 70 degree heat enjoying some backyard time with a Warped Lirio Rojo paired with a bottle of Bourbon County Brand Midnight Orange Stout. Warped Lirio Rojo originally made it’s debut back in 2015 with only 40 cabinets of 50 being released but has since made it’s return in similar limited quantities each year since. Translated to “Red Lilly” The Lirio Rojo is created at the TABSA factory in Nicaragua using an all Aganorsa Nicaragua blend of tobaccos. 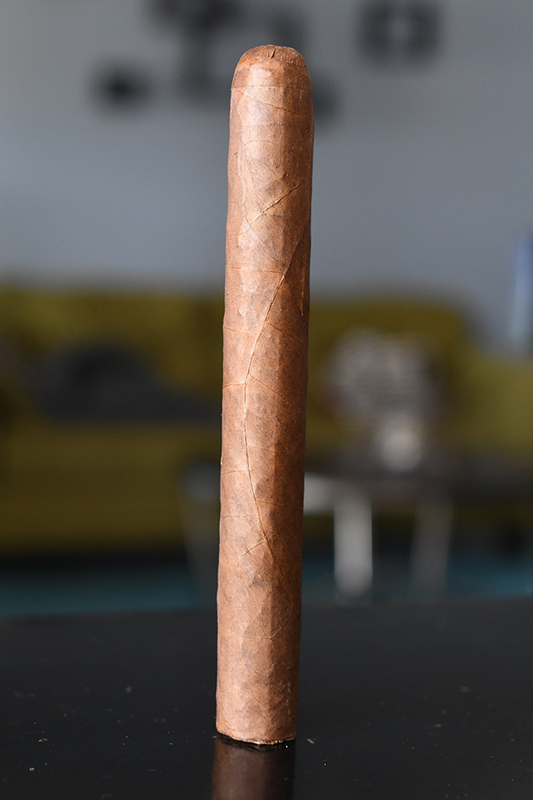 The cigar is offered in only one single 5 1/2 x 44 size running $10.25 per stick. Big thanks goes out to my buddy Jason for hooking me up with a handful of these beauties. The Warped Lirio Rojo starts out with a gorgeous, rustic looking medium brown wrapper with lots of areas of darker brown as well as orange spotting. 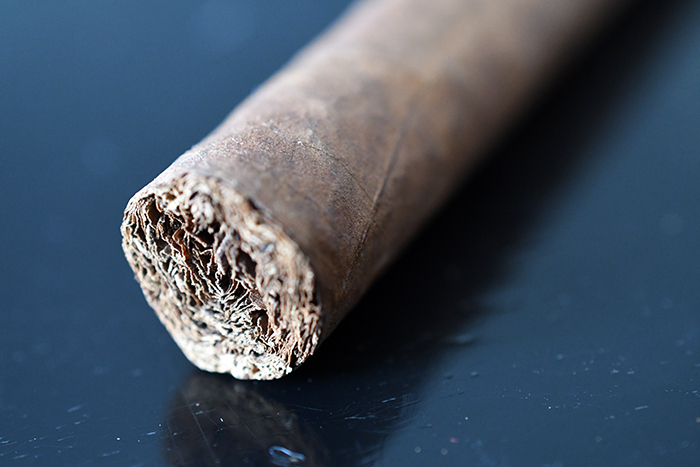 The cigar’s texture carries a good amount of gritty tooth along with some mild veining and a good amount of natural webbing scattered throughout the cigar’s body. 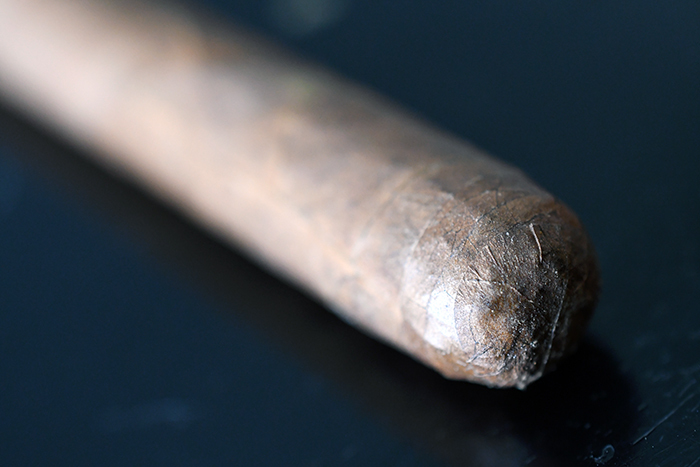 The wrapper is laid seamlessly over itself leading up to the cigar’s round, triple-wrapped cap. This cigar has a good amount of weight to it as its packed pretty tightly. The cigar is firm I the hand and I found no soft spots what so ever. 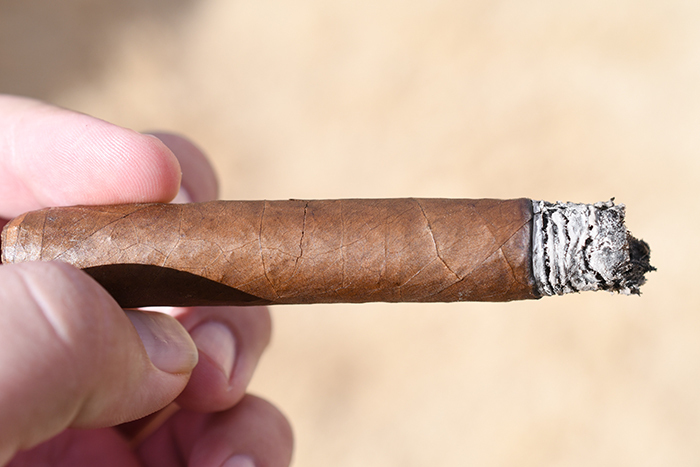 The wrapper on the Warped Lirio Rojo gives off a ton of sweet cedar and mixed natural tobacco aromas while the foot of the cigar gives off more spice, pepper, and earthy content. The cap cut clean and easily using my Xikar XO double bladed cutter. The cold draw produces carries a good amount of honey and cedar backed by spice and natural tobacco flavors. The Warped Lirio Rojo starts out with a good amount of spice and subtle black pepper. The pepper fades very quickly in this one revealing more spice along with bold notes of citrus, honey, vanilla, and cedar backed by some light pine, earthiness, and soft cocoa. 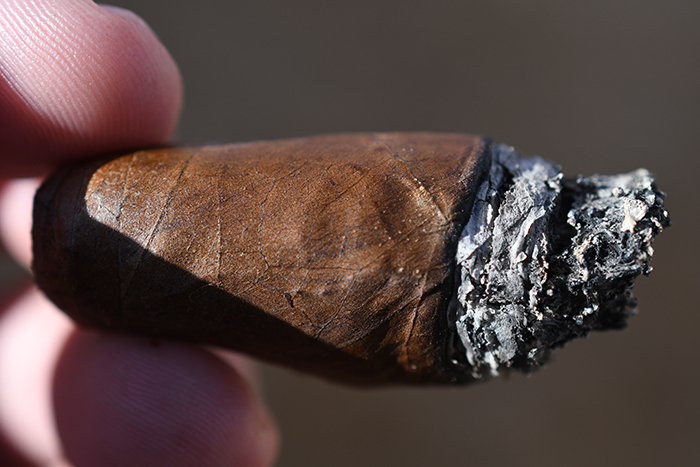 The draw is slightly tight but after about an inch in it really opens up kicking out great amounts of thick, gray smoke which dissipates very quickly while the cigar gives off almost no stationary smoke as it rests in my ashtray. 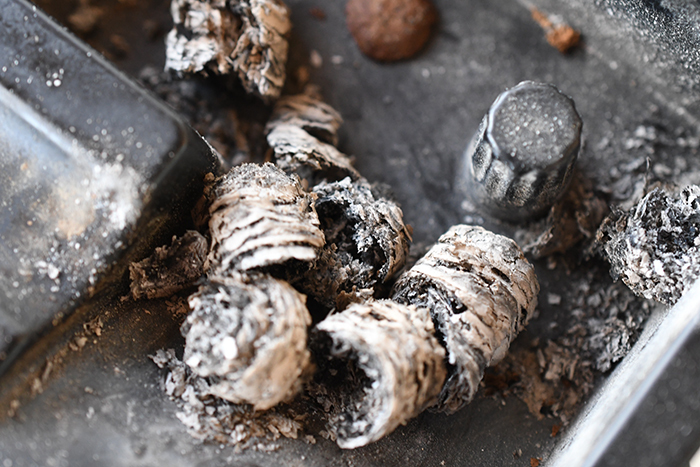 The burn line is pretty even and thin leaving behind a trail of tightly compacted white and light gray ash which held on for almost an inch before giving way. Into the second third of the Warped Lirio Rojo and the cedar has really taken charge of the flavor profile backed by bold spice, vanilla, and citrus along with soft notes of honey and earthiness. The retrohale really brings out the cedar and the spice and I find myself doing it quite often. I close out the second third with a tiny bit of nicotine kick while the cigar has been burning flawlessly up to this point. Into the final third of the Warped Lirio Rojo and the flavors are just pouring on. The cedar and vanilla are front and centered back by notes of honey, cocoa, earthiness, spice and pine. It took me an hour and a half to take this cigar down to the nub an I experienced absolutely no harshness nor extended heat. 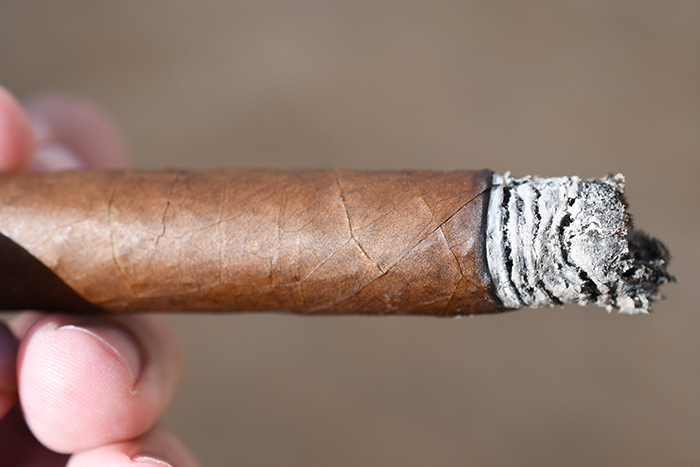 The cigar burned absolutely beautifully from start to finish and left with me with only a trace amount of nicotine. I have been a huge fan of Warped cigars and it seems they continue to kick out top notch cigars one after another. The Warped Lirio Rojo carries a unique and complex profile without making the smoker dig too deep into the flavor to appreciate the experience. I love when companies put the onus on the experience by not overly marketing the product with crazy artwork, band design, or box design. Sure these are limited but they have done their best to make them available year after year at a price that I wouldn’t mind paying for considering how much I enjoyed it. Goose Island’s Bourbon County Brand Midnight Orange stout is a 15.2% ABV Imperial stout aged in bourbon barrels with oranges. If you are as familiar as I am with German holiday chocolate oranges you’d know exactly why this beer is so appealing to me. The beer leads with heavy, sticky toffee, vanilla, malt, chocolate, bourbon, and a nice citrus with notes of cedar and a very heavy mouthfeel finishing sweet with more toffee vanilla and cocoa, notes of light citrus and tons of bourbon. This is a damn good beer and I am glad to see that the orange isn’t over the top. The vanilla, citrus, and cedar is what really enticed me to pair this beer with the Warped Lirio Rojo and I am glad I did as the flavors married up beautifully.